It's kind of like a game of spot the differences, isn't it? At this small size the painting may not look that much different. It's really in the closeups where you can see the improvements. 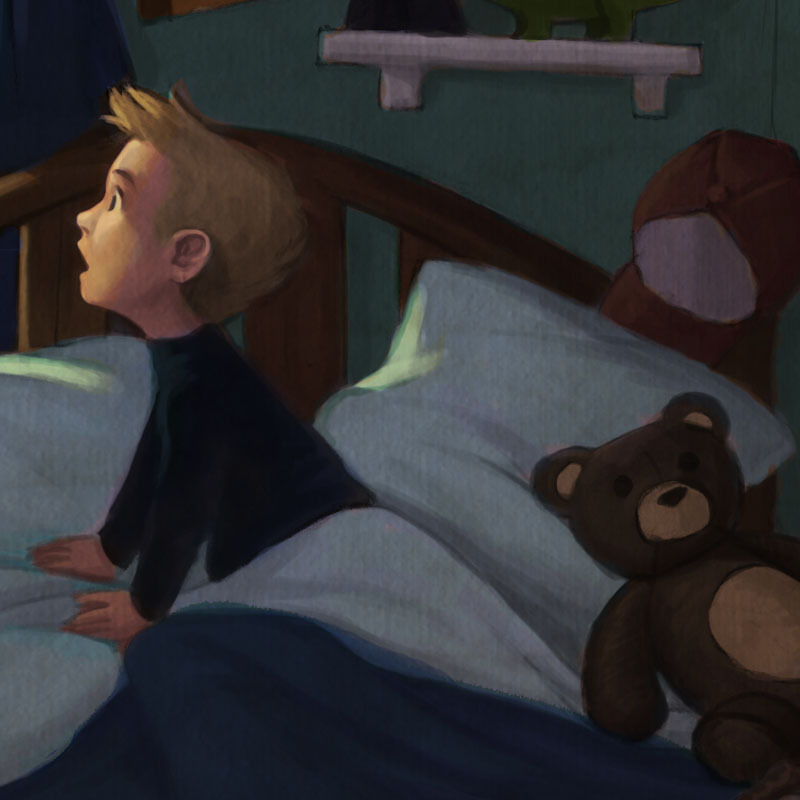 This time I extended the composition to work as a double-page spread in a picture book. I rendered the dinosaur and everything a lot more than before. 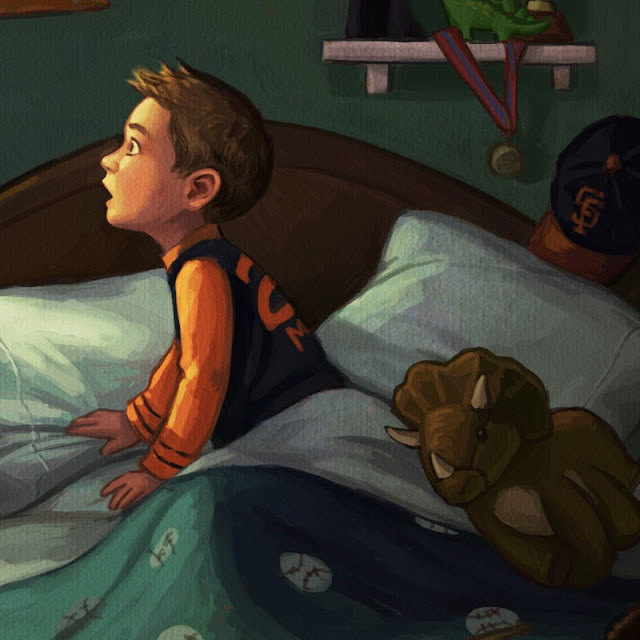 But the biggest thing I did was put more design into things: adding a pattern to the plain blue beadspread, making the plain lamp a dinosaur lamp, changing his weird black pajama turtleneck into a Giants jersey, replacing the generic teddy bear with a stuffed triceratops. This painting is inspired by my little brother Chris. 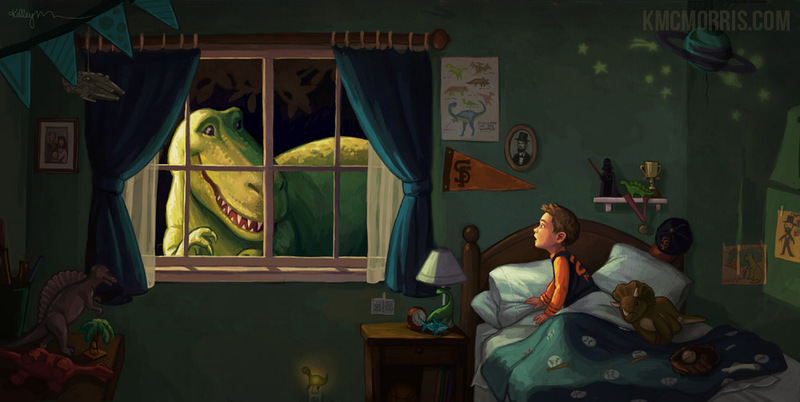 Sometimes I would tuck him in bed at night, and he would ask me to tell him a story. So I would make up some silly story about "a little boy named Chris, who was just starting to fall asleep for the night..." and then dinosaurs and Darth Vader and Barry Bonds and all his favorite things would happen to him. 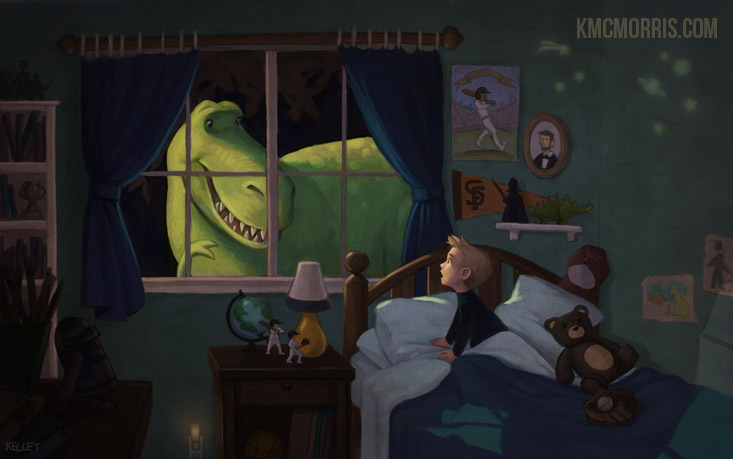 When I look at this painting, I regret not taking the time to tell Chris more stories. There were too many nights when he begged for a story but I squirmed out of it. What was I so busy for? Where did teenage Kelley have to go that was so important? I'm sorry about that, Chris. Great improvement! Like you said, it's all in the details but that really pumps up the story-telling. 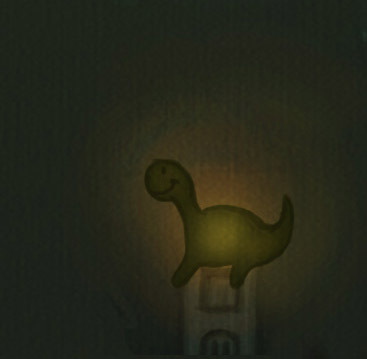 I LOVE the little dinosaur night light change... adorable. Also the colors are more vibrant and makes the scene feel a bit more magical. Great illustration. Thanks Misa, I appreciate it! I enjoyed spotting the differences and really like the repainted version, but I esp. enjoyed your sisterly affection for your brother, even now. Well done! I didn't realize this illustration was connected to you by such emotional history. Thank you for sharing that, and again -- awesome work. 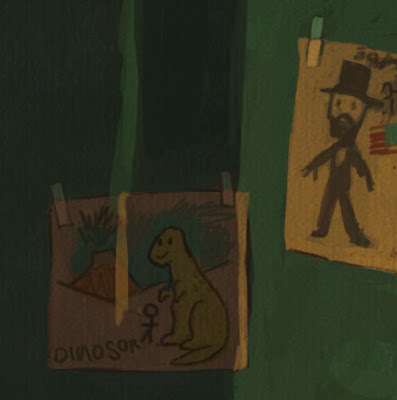 I love the new painting. You improved it so much. The lighting and the details make all the difference. Bravo! I am a new fan of your work.